Once again I took a trip to Southern China, once again I did not have enough time to see and do everything I wanted. I visited Shenzhen, Zhuhai, and Macau in the same trip, one night in each city. Shenzhen is a major city supposedly the richest in China, I spent most of my time riding the subway. 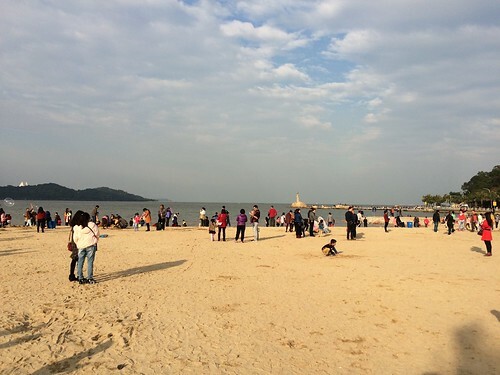 Zhuhai is popular with Chinese tourists because it is right on the beach and the gateway to Macau the gambling capital of the world. I flew to Shenzhen but the weather was not in my favour neither was my hotel booking. It was almost the farthest metro station from the airport which isn’t actually connected to the metro, you must take a bus from the airport to the nearest metro station, I think it costs 2 RMB but many people will try to convince you to take their cab. Before my trip I developed some sort of skin problem and I scratched myself entirely too much on the way to my hotel. So after checking in and freshening up I set out to buy skin cream as the cream I brought from Canada was pretty much used up. After buying some Chinese hydrocortisone cream I decided to eat and get a beer, Shenzhen has several craft beer options. I settled on BionicBrew as it was 4 km closer to me than Taps. Next door to BionicBrew is the Peko Brewing Company so I ended up having two or three more beers than I planned and due to it being a rainy night I stayed there until the subway stations were near closing then went back to my hotel. 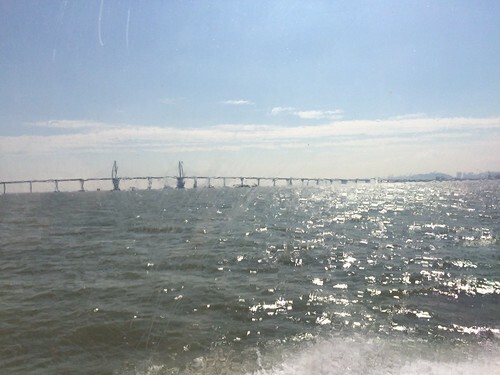 The next morning I went to Zhuhai by boat. This involved another long metro ride, thus my impression I spent most of my time in Shenzhen on the metro. The ferry ride was fine, they are building an unbelievably long bridge beside the ferry route. I tried to photograph it but it was hazy and water splashed on the windows, I got a couple of OK shots but none that do the massiveness of the bridge justice. Zhuhai has no metro so I took a cab who didn’t get me to my hotel, I walked the last 500 meters navigating via my iPhone. My hotel was nicer than I thought it would be, I got some sort of day room at the hotel next to a spa it had no window and glass doors on the bathroom but the place was respectable and classy there was a Bentley parked out front when I left to take the bus to the Fisher Girl. 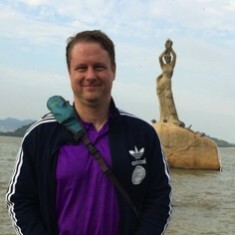 The Fisher Girl and the surrounding bay and beach is the selfie spot in Zhuhai, I actually got someone to take my photo. After that I went for dinner at a very high end and popular Chinese restaurant. I think dinner cost more than my hotel. 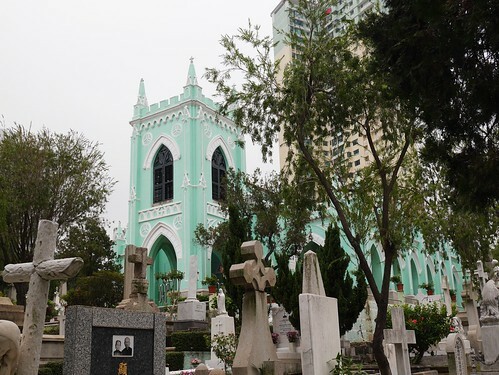 The next morning I got up and took the free hotel shuttle to the border and walked to Macau. Somehow I got it in my head it would be cool to walk to Macau but 10,000s of people do it everyday. Crossing the border took time and my brand new passport caused problems as my entry stamp into China was in my old passport which I did not have with me. In Macau I had to get the local currency from a bank machine then break the 500 MOP bill at McDonalds then I overpaid for the bus, missed my stop and decided to ride it all the way around, but this bus just goes to the other end of a chain of islands and then you get out over pay for another trip back because you still don’t have the right change and ride back to the port missing your stop again even though I and others told the bus driver where I wanted to go. Finally since my mainland phone would not work, I walked using a paper map to my hotel. I lost the best light riding the bus back and forth, not to mention precious time but I can honestly say I’ve been up and down Macau, Tapia, and Coloane. I then went in search of aloe vera which even the lady at the pharmacy didn’t know she sold. I also went to the post office, the book store, the ruins of St. Paul’s Cathedral and I already had a few snaps of the Hotel Grand Lisboa. 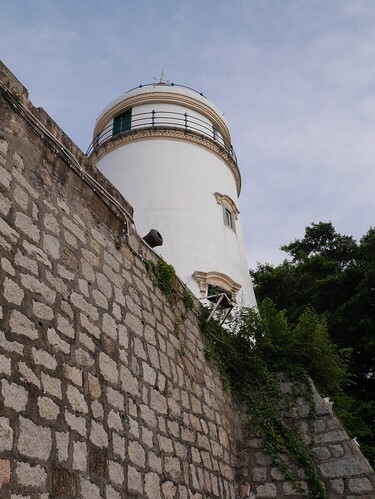 I climbed the hill to Monte Fort but the best viewpoint in Macau is Guia Fortress where I went up to the next day. I’d like to be up there as the sun sets and lights come on and of course I’d want a clear pollution free day. It is possible to get very close to the fortress via car, but I climbed the whole hill and walked from my hotel. After getting dinner I went back to the Cotai Strip via the now mastered bus route 25. I wanted to go to the Hard Rock Cafe and get a souvenir. I also got a beer and took some photos. I wasted way too much time trying to navigate the shopping complex next to the Venetian Hotel. I got the fake Venice selfie and the Cotai Strip at night selfie. I did not gamble. The roulette wheels I saw had no person running them and they don’t want RMB anyway ruining my plan to but 100 RMB on red. Rather than waste time in the casino or at the Venetian further I set out on foot on the 30 minute walk to the Galaxy which supposedly contained one of the finest whiskey bars in Asia. I should have taken a cab there was a tonne of construction and I was walking alone at night, but the casinos are so huge you can just head in the general direction of the next mega casino and detour as needed around construction. The bar did not disappoint way too much expensive whiskey. I had a Macau beer and Pulteney 12 Year Old because it is form the Northernmost distillery in Scotland. Then I had another beer as the Pilipino bartender convinced me to make a request. I wrote down three Warren Zevon songs from the same album, but none were played. The band consisted of a piano player and a female singer came to talk to me afterwards. I almost requested Randy Newman but I thought considering the success Linda Ronstandt had with Zevon songs they might suit her. 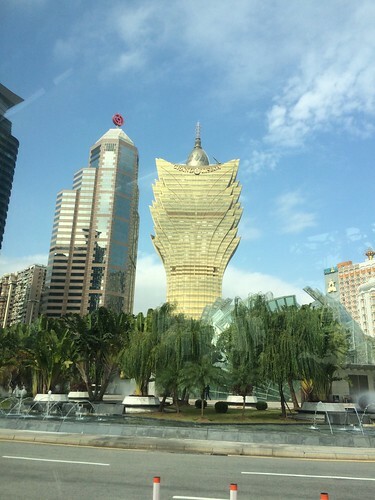 The next day I did more sightseeing, took more photographs, and made an official Facebook checkin to the Hotel Grand Lisboa for my mom, she liked that building which I knew she would, I had already mailed her a postcard of it, but the official checkin was more immediate. There is free WiFi everywhere in hotels even on the top of Guia Hill in the fortress which I used to take a video and upload it as well as check out who won the UFC fights. As always I uploaded the best photos to Flickr, the best of the best of which are in this album. I’ll include a couple below for the lazy. I’d visit Macau again, maybe I’ll even gamble next time. I was waiting for a UFC fight to be scheduled but after skipping Tokyo and Seoul and having not traveled home I had to travel somewhere before I settled down to the long hard CFA® exam slog. I plan to study everyday until June 4th but people are already asking me to travel elsewhere. We shall see how my studying and resolve goes. Although I was a single dude in Macau I did not read this guide before I went. 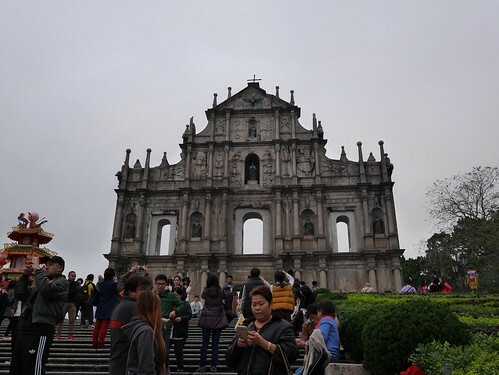 I hope to visit Macau again someday, I agree it is not Vegas but it is definitely warmer than Northern China, I still wish I would have gotten to see a UFC fight, I just don’t seem to have luck, or enough money, or a high enough tolerance for risk. Hopefully in the future my life will truly be better and I’ll no longer be a single dude. 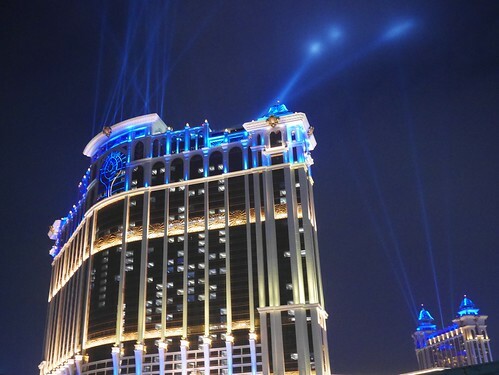 Next time I go I probably will stay in a mega-casino hotel complex, hopefully one with a gym and a pool, because I visited Macau in the dead of winter it will likely be hotter next time. Perhaps the Sheraton has the best gym, but that wouldn’t be my vote based on pictures I’ve seen, the Venetian gym looks nice. Hong Kong also has some very fancy gyms and I’ve never been to Hong Kong. Eventually I got invited to travel to Hong Kong even trained at one of the fanciest gyms. I also finally went to a UFC event when they came to Shanghai. 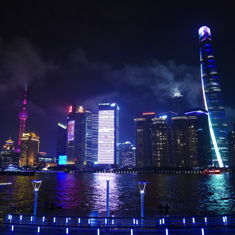 I’ve also compiled my Top 10 China blog posts so if you want to read more about China you should check those posts out. This entry was originaly posted on January 20th, 2016 , it was last edited on January 27th, 2019 and is filed under: Asia and tagged: China, Macau, Photos, Shenzhen, Zhuhai.